At the start of Sha Sha Higby’s “Paper Wings III,” undulating lighting effects seem to place us underwater, while the sounds evoke bird song. The effect of bird song underwater is other worldly, and that sense of an encounter with another world increases, beautifully, throughout the entire performance. It is all like a waking dream. Although Higby performs in a mask, completely hidden inside an elaborate costume which transforms again and again in amazing ways, the sense of her intimate presence and deep connection with the viewer is astonishing. The feelings get weirder and weirder. Higby not only dances but begins to produce sound from inside the costume, like an alien language. This performance is not a story so much as an encounter. The Creature is engaged in a mysterious and enthralling activity, which is not clearly defined. Various puzzling objects of unclear significance appear from nowhere, like magic. The Creature seems intent upon showing us something. But what? We feel we are being drawn into a myth which is beyond words or even story. The Creature could be a playful child, or something unimaginably ancient. At less than hour for the entire performance, it is as abstract as a symphonic poem. “Paper Wings III” is an extraordinary experience of theatre, radically original, and unforgettable. 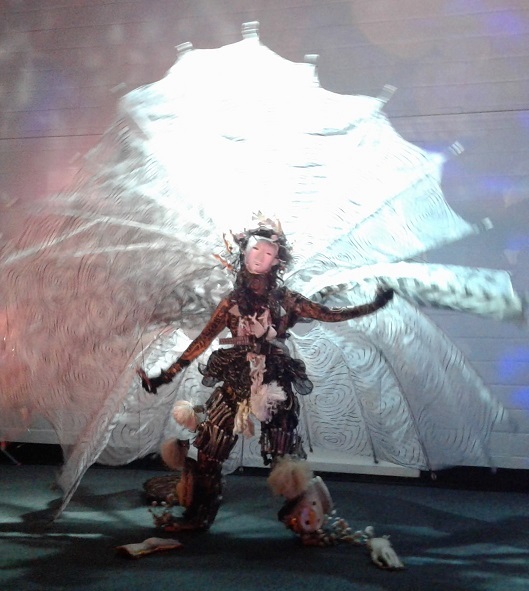 Sha-Sha Higby can be seen performing “Dance In A Sculptural Costume: Paper Wings III” at the Throckmorton Theatre in Mill Valley on June 10th. For further information, click here. To read TheatreStorm’s recent interview with Sha Sha Higby, click here. Rating: ***** (for an explanation of TheatreStorm’s rating scale, click here. Posted in Reviews.Tagged Charles Kruger, Dance In A Sculptural Costume, Paper Wings III, Sha Sha Higby, theatrestorm.